There you go. Simple and yet so special in it's very own delicious way. Looks good enough to tempt me to tear a bun to chomp it down for sure. 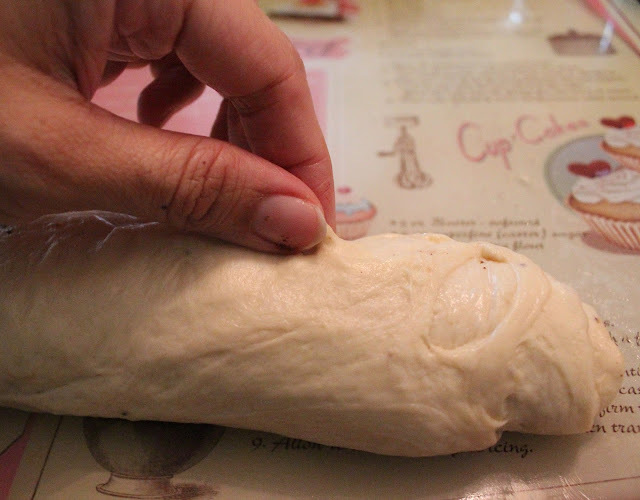 ;9 And guess what, it is a straight dough method again! Lately I am so digging into straight dough method. Save time and the hassle of having to wait for the pre dough to age for hours in the fridge. 15 g butter ( for coating the bread surface). 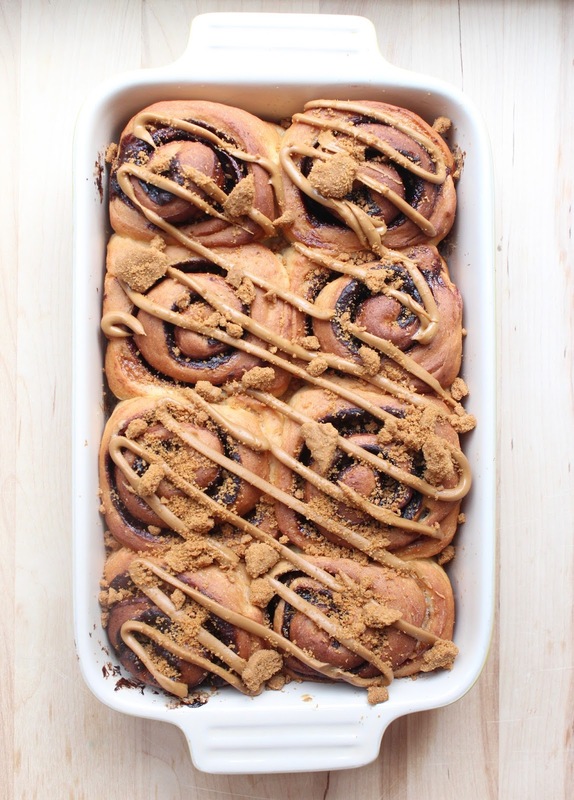 Grease the baking dish and prepare the chocolate cinnamon mixture. In a small mixing bowl, add in chocolate powder, cinnamon powder and brown sugar in. Mix well and set aside for use later. 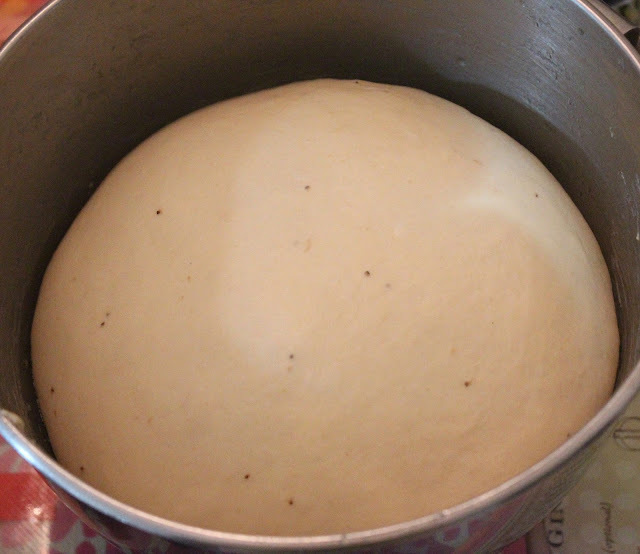 Punch out the air for the proofed dough. 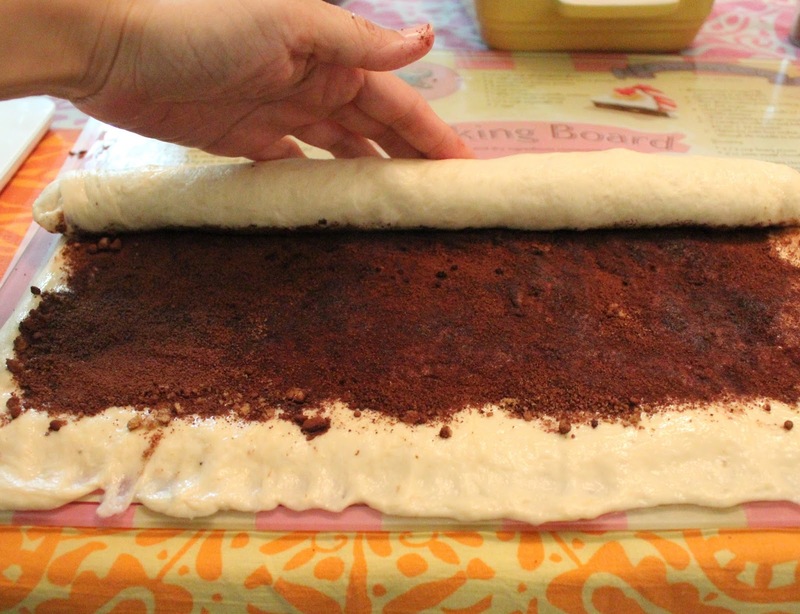 Then roll it flat into a 25 cm by 20 cm square. Butter the surface generously. 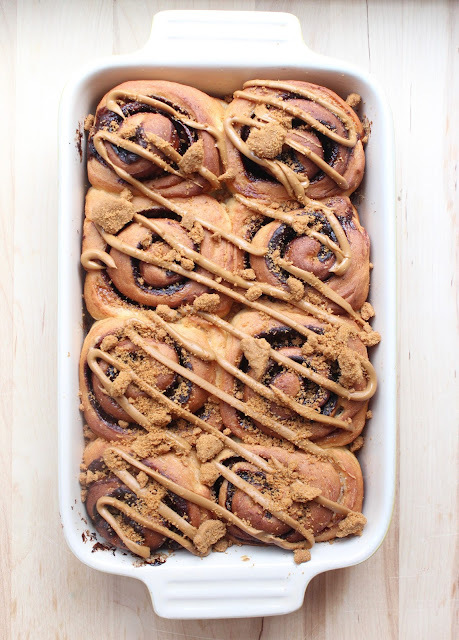 Next you sprinkle the chocolate cinnamon sugar on the butter coated bread surface. Then spread it out evenly...yes use your best tool to do this. Next you roll it up from the longer end, like a big Swissroll. Seal the edges when you complete the rolling. You then divide the rolled dough so that each portion is about the same size. 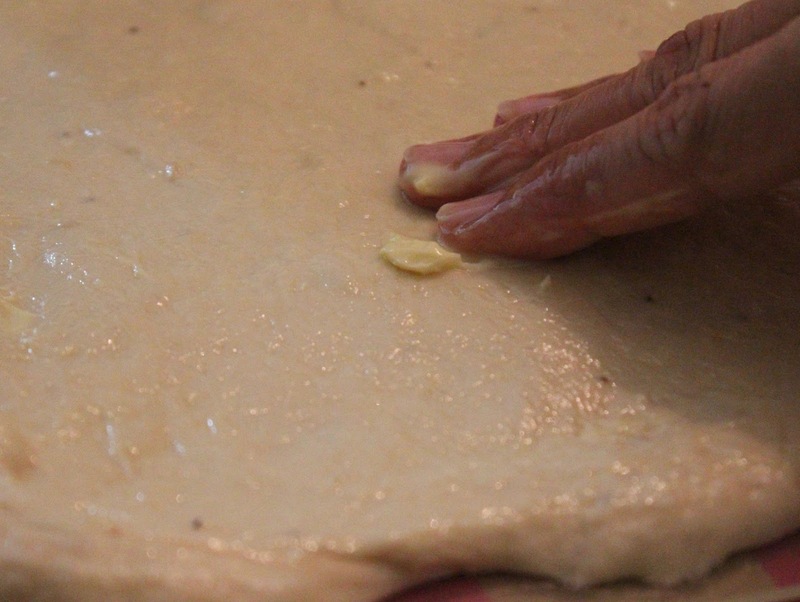 The trick is to divide the whole dough into half. Then the half into halves and so on and so forth. 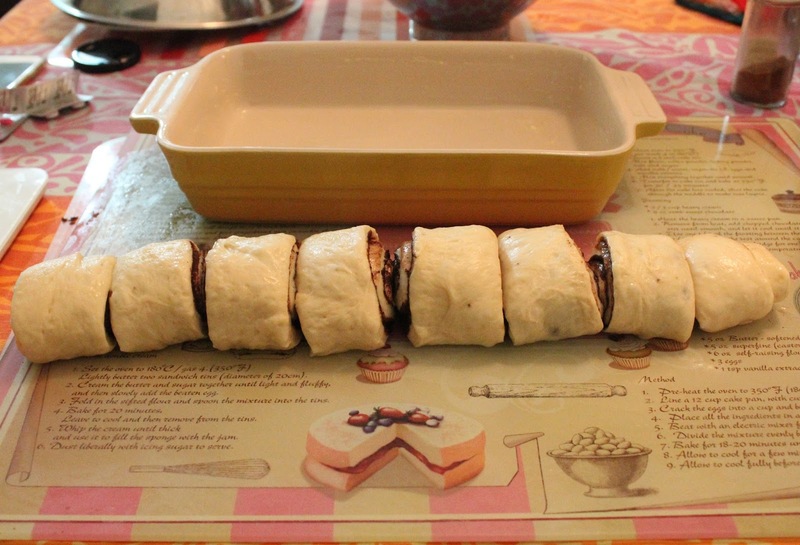 Carefully place the rolls into the greased baking dish. Let it proof till it fills the baking dish or doubled in size. Bake in the preheated oven for 25 to 27 minutes till golden brown. If the top browns too fast, cover it with aluminium foil and continue to bake. 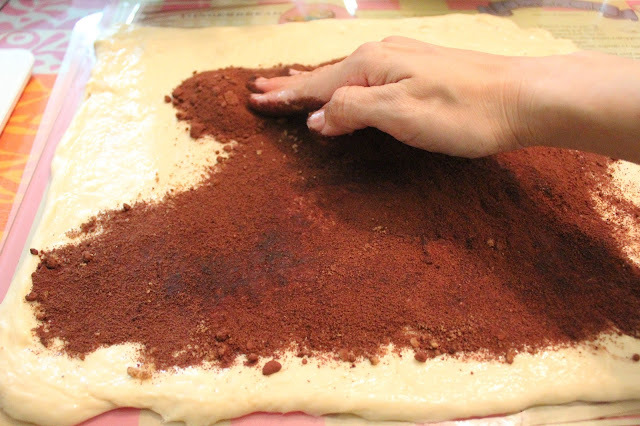 When baked, remove from the oven and let cool before adding the toppings. 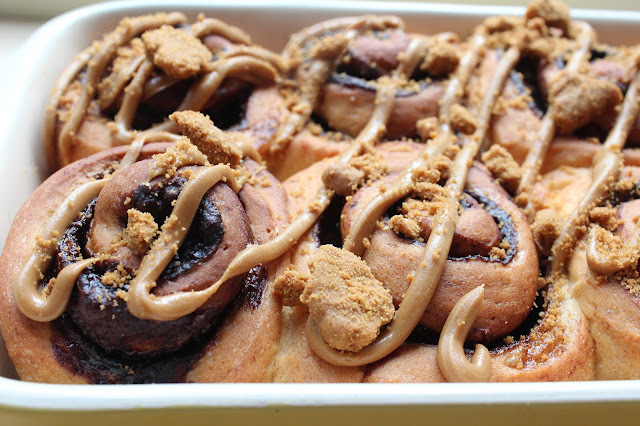 Scoop the speculoos butter into a piping bag, Simply pipe the butter all over the top of the rolled buns. 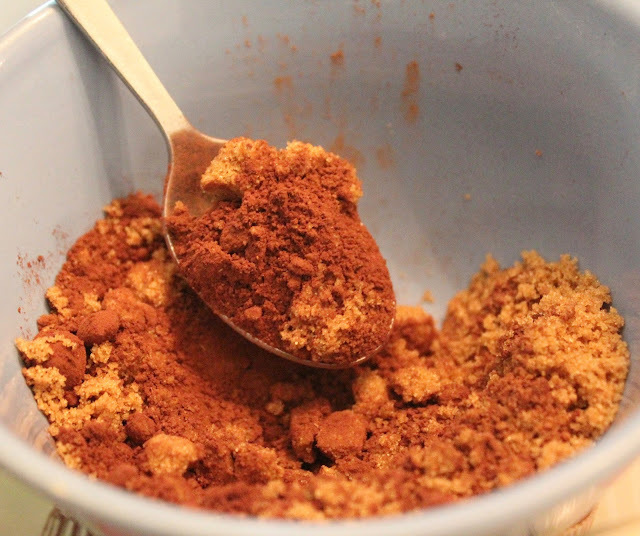 Then sprinkle the crushed speculoos cookies over the top. The butter will help adhere the crushed biscuits to the bread. It spells comfort all over. I think I will dream of this tonight...wait, I can have a roll! 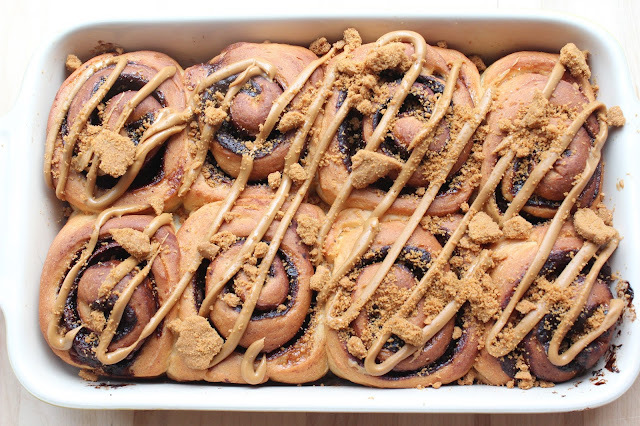 You can too and not just dream about it...just get on with it and bake! Try and let me know ya? Have a good day ahead guys. 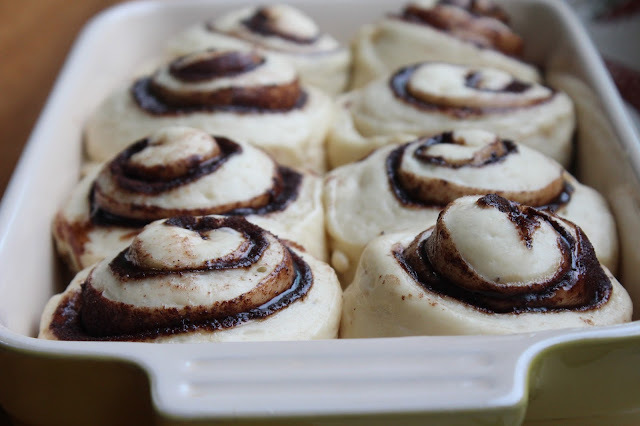 Stay happy and baking! It all started last week when I helped my parents run some errands. 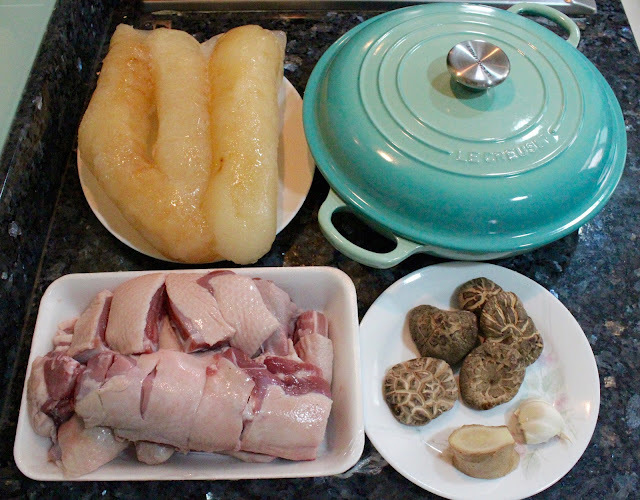 At the end of it, my dad "rewarded" me with 3 humongous sea cucumbers and asked me to go home and cook it. I was like "What? Wait...., I don't, I don't know how." But he was already happily packing it with ice packs and reciting the recipe as if I am a memory sponge. Okay...I did catch some of the key steps. What recipe? One of my dad's all time favourite. It is yet another traditional Hokkien dish which I should have taken up long ago. 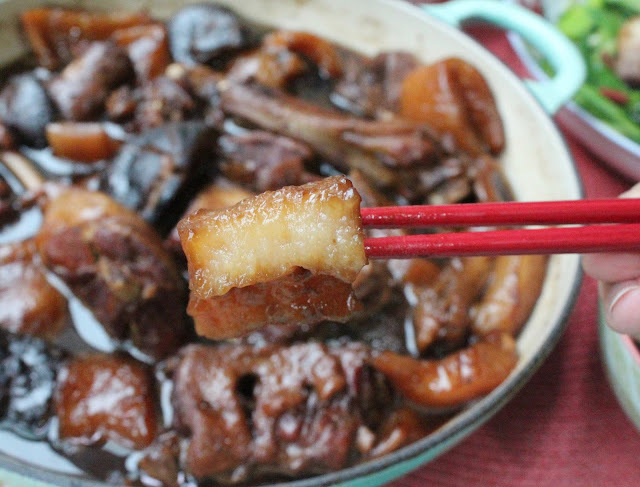 None other then Braised Duck with Sea Cucumber (海参鸭) of course. Such a heart warming dish that brings back so much fond memories of my childhood. I don't get to have this often at home when I was young, since sea cucumber is considered a luxury ingredient, then and now, especially good ones. And seems like we only get to enjoy this dish on special occasions or when my dad buys really good sea cucumbers. I am glad that my first attempt turned out quite well. In fact I am very please that my family did finish most of it at one go. And of course, I am glad I used my Le Creuset Buffet Casserole to cook this dish. Again this cast iron pot did a great job retaining the heat and cooking all the ingredients evenly. I reckon I only used 3/4 of the time or less to cook this dish using this buffet casserole verse using a normal pot. And that Cool Mint colour is so lovely can! In a mixing bowl, place the rinsed and chopped half duck into it. Then add in all the ingredients for the marinate. 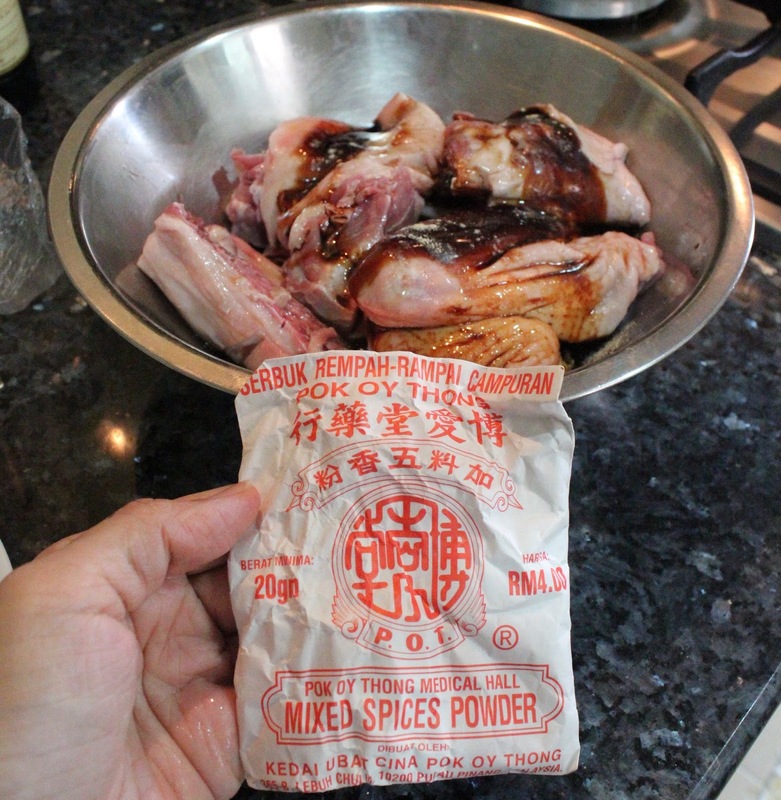 Toss well to coat the duck meat with all marinate. Note that I use this awesome brand from Penang, super fragrant, but you can use any brand you fancy of course. Cover and leave the duck to marinate for a good 1 hour before use. Chill in the fridge. After an hour, heat the buffet casserole over the stove at medium low fire. 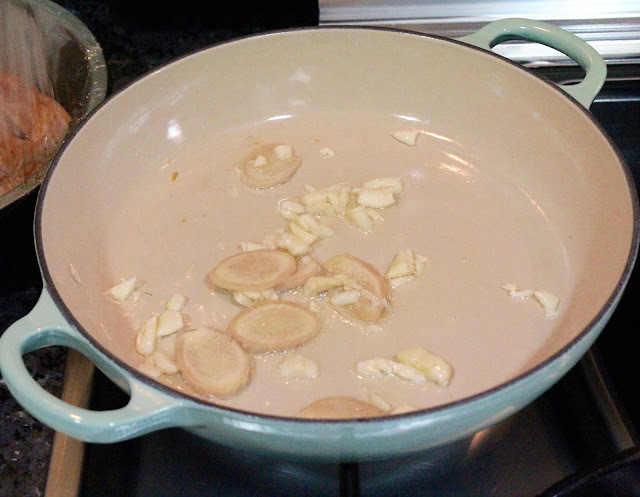 Add a tbsp of cooking oil follow by the smashed garlic and ginger slices. Cook till aromatic. Next, add in the shitakke mushroom and cook for a minute. 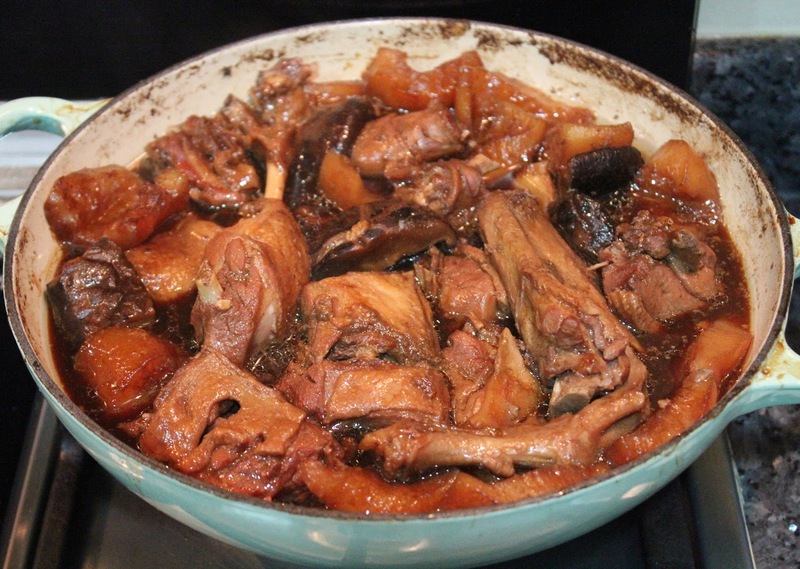 Finally, add in the marinated duck meat to the casserole. Cook for a few minutes and add in the ingredients for seasoning and note that only 300 ml of the chicken stock is added. 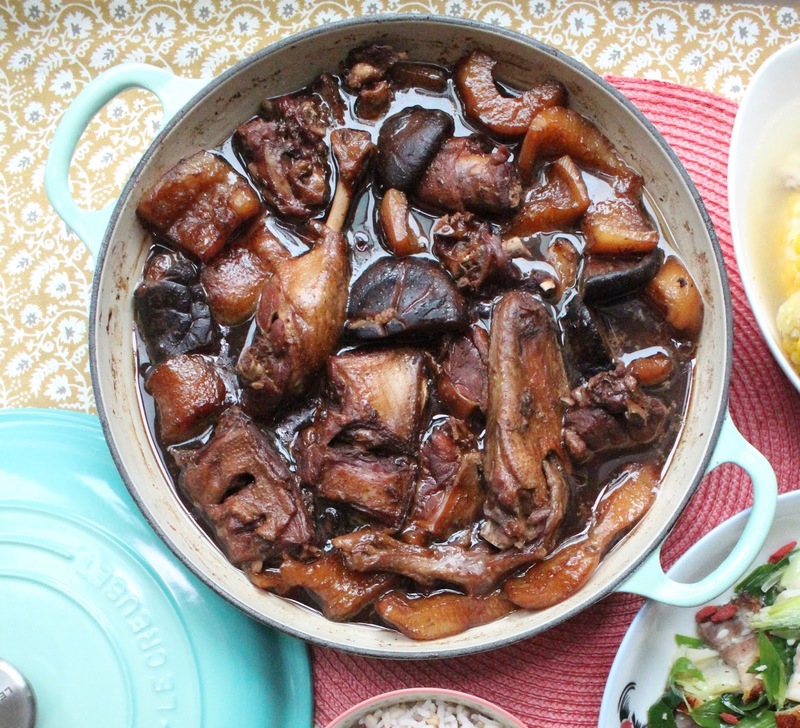 Toss it to coat the duck meat. Lastly, add the sea cucumbers in. Toss and cook awhile and bring to a boil. Lower the fire to a simmer and cover the casserole. Let cook for approximately an hour and checking occasionally, making sure the dish doesn't dry out. 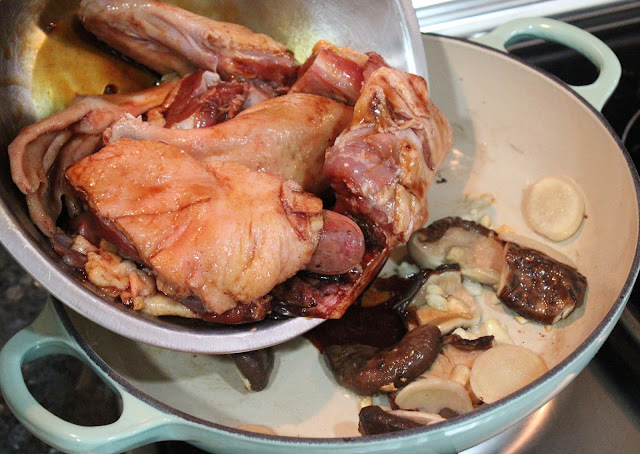 Add the remaining 300 ml of the chicken stock along the way as you cook the dish. 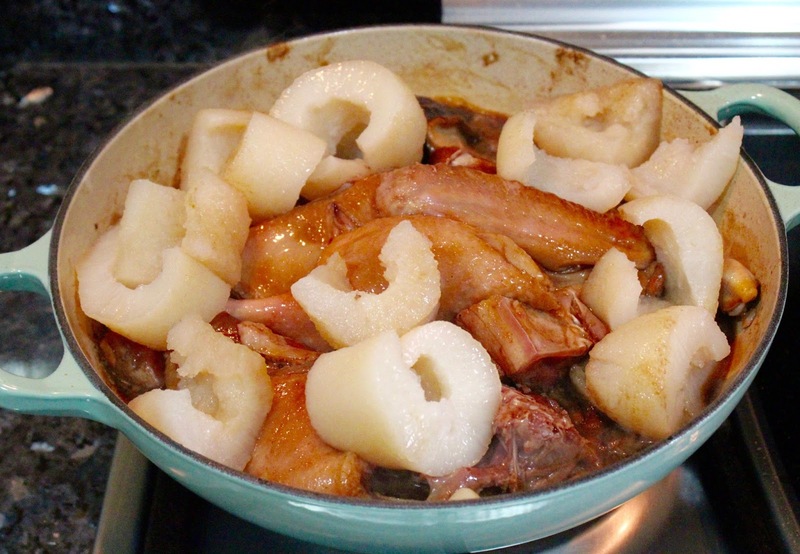 The duck meat should be tender and almost falling off the bone, the sea cucumbers should be soft and yet still thick-jellish like. I know...the pot looks like a mess. But trust me, it is still speckless after I washed it up. The special enamel coating on the pot protects it from heavy braising and stewing. And yet the dishes always turn out so beautifully cooked. So awesome isn't it !? A delicious authentic meal is much easier to prep then you can imagine! Family totally approve this, especially that my small kid was loving the soft gelatinise sea cucumbers. Oh so yum. :9 I can just eat this! But the duck meat is equally awesome of course. And I am already planning how should I cook the rest of the sea cucumbers I have left. 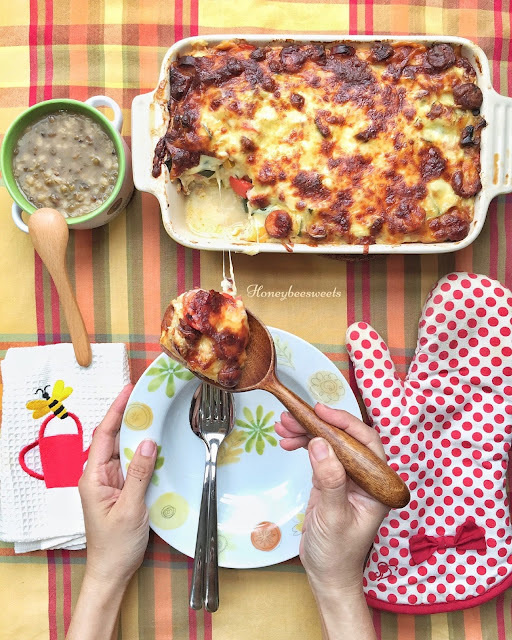 If you are interested to purchase this lovely Le Creuset Cool Mint Buffet Casserole, do hop over to here to check it out. Else, remember to drop by the cookware section when you go shopping in town next time. Hope you will try out this dish. Perhaps during the next family gathering? Go ahead and impress all the elder folks with it haha! What do you usually do on days when you have no time to cook at all. I know most of the answers will be either eat out or pack back. Call me a weirdo, I don't like to do either of that. :P Not that I don't enjoy outside food, it's just that I try not to eat out if possible. I would very much prefer to make ahead a set of meal in the fridge, then I can bake it right away when I get home or ready to cook it. 30 minutes in the oven and dinner is ready! Don't we all wish we have such meals in the fridge all the time?! Well, the magic of it all is to plan ahead. Knowing that particular day will be too busy to cook, just prepare in advance. 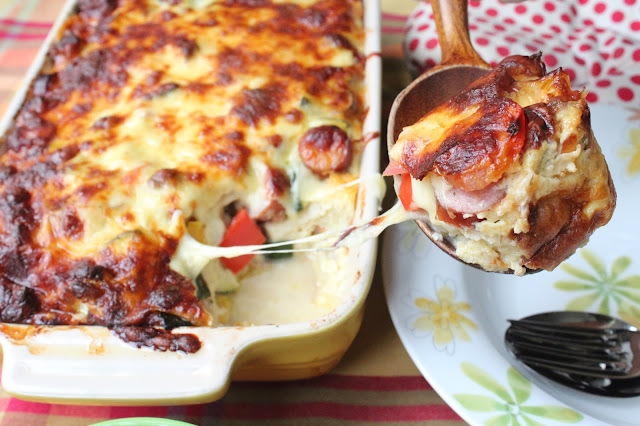 And this Baked Ratatouille Sausage Strata is one of them dishes that you can do exactly that. Actually got this fabulous idea from Dairy Goodness. And watching the video she posted totally convinced me to try out this easy dish even though I was not planning for a busy day's meal heh heh. :P Did some modification to the recipe to suit my family's preference. I am sure most of us know what is Ratatouille. But what is Strata? 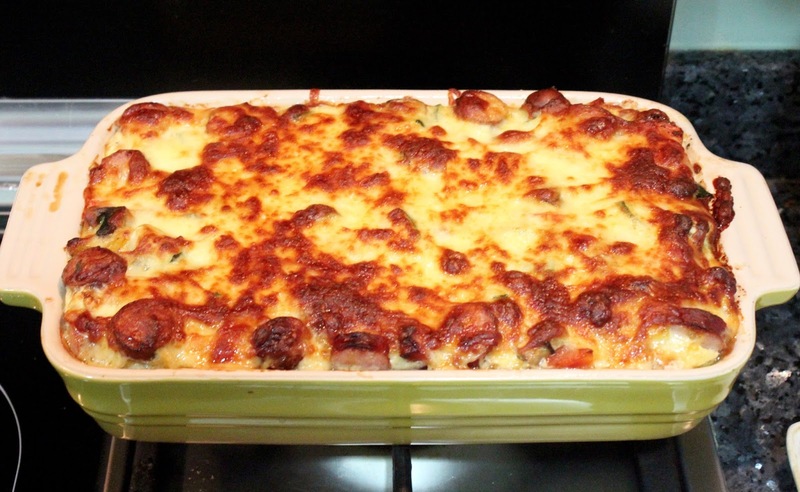 Strata is a family of layered casserole dishes which mainly consists of bread, eggs and cheese. 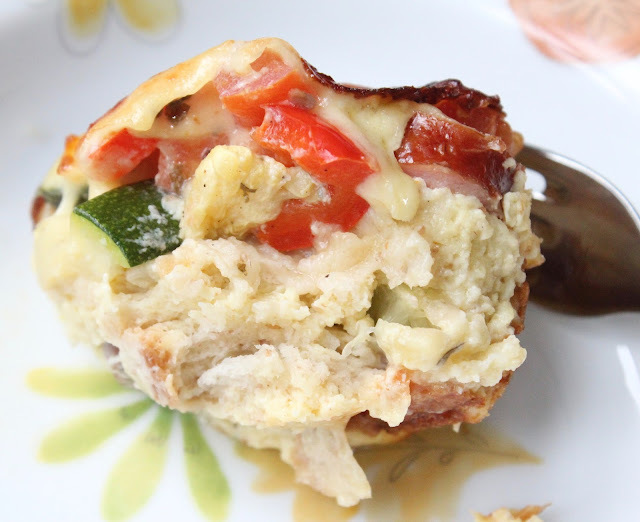 Pretty much like frittata and quiche in another form. 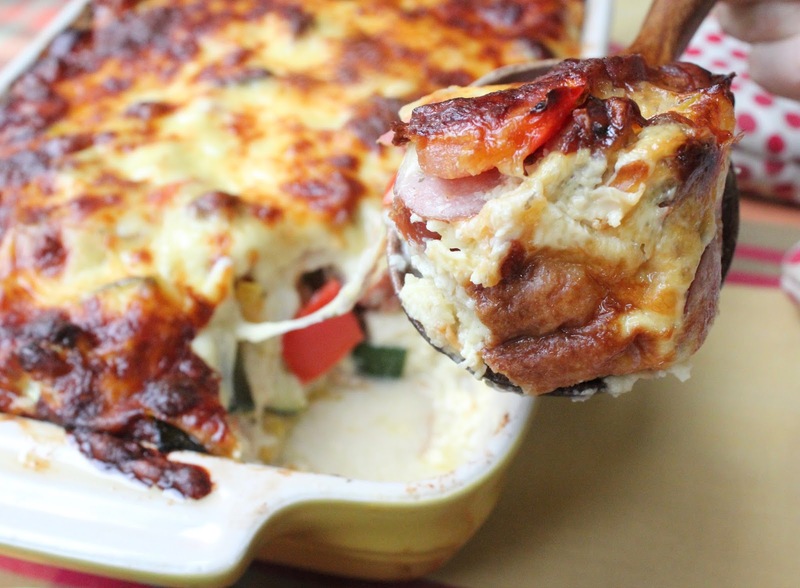 So Ratatouille Strata would consist of vegetables layered in the casserole of bread, eggs and cheese. Sounds delicious already! So let's get started! 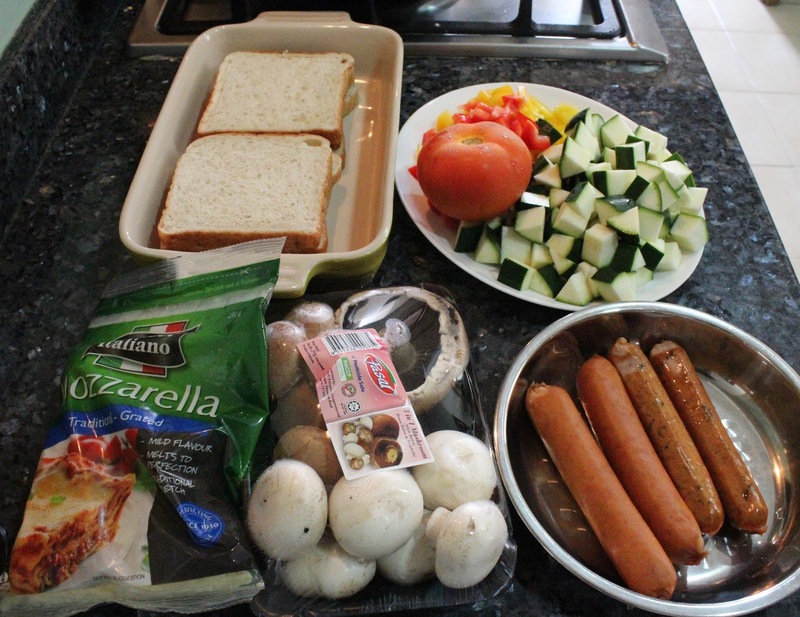 Cut the vegetables, namely zucchini, bell peppers, mushrooms and tomato into cubes. Transfer them except the tomato, into a large mixing bowl. Add in some olive oil, salt and pepper and toss well. Then lay them on a baking sheet lined with parchment paper. 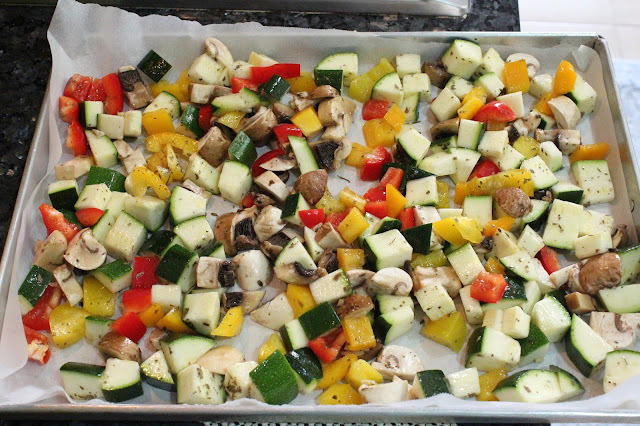 Bake the vegetables in the preheated oven for 15 minutes or till it has soften. Toss in the middle of baking. In the meantime, grease the baking dish and slice the bread diagonally into triangles. Slice the sausages into smaller bite size pieces as well. Next prepare the egg custard. 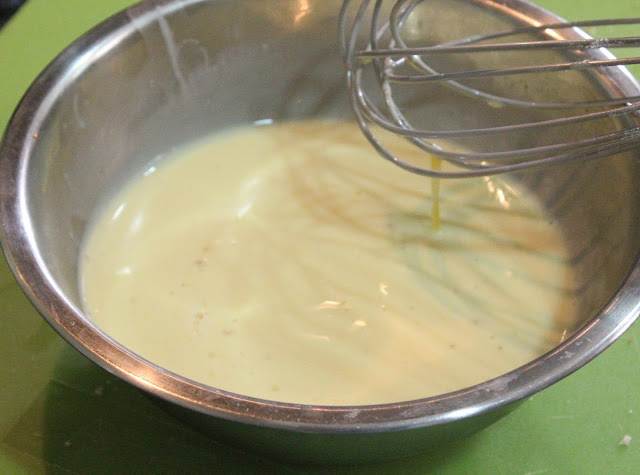 In a large mixing bowl, crack the eggs in, pour in both milk and heavy cream. Season with salt and pepper,1/2 tsp of chicken seasoning ams 1/2 tsp sugar. Whisk well and set aside for use later. Once the vegetables are done, remove from oven and add in the chopped tomatoes. Toss and mix with the other vegetables. Place a layer of bread on to the greased baking dish. Then scoop about half of the roasted mixed vegetables over the bread layer. 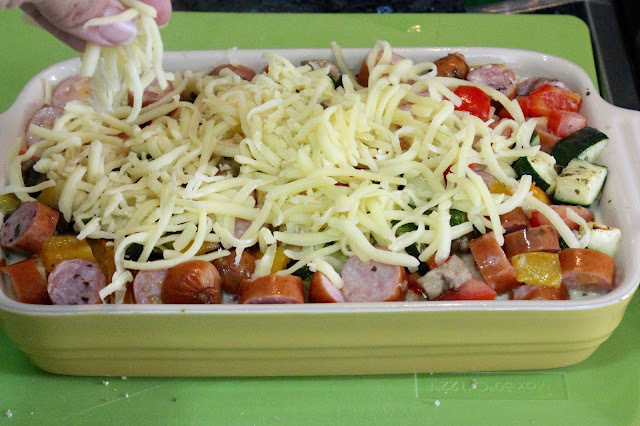 Also gather half of the cut sausages over the vegetables. Repeat the same as before, place another layer of bread slices over the mixed vegetables. 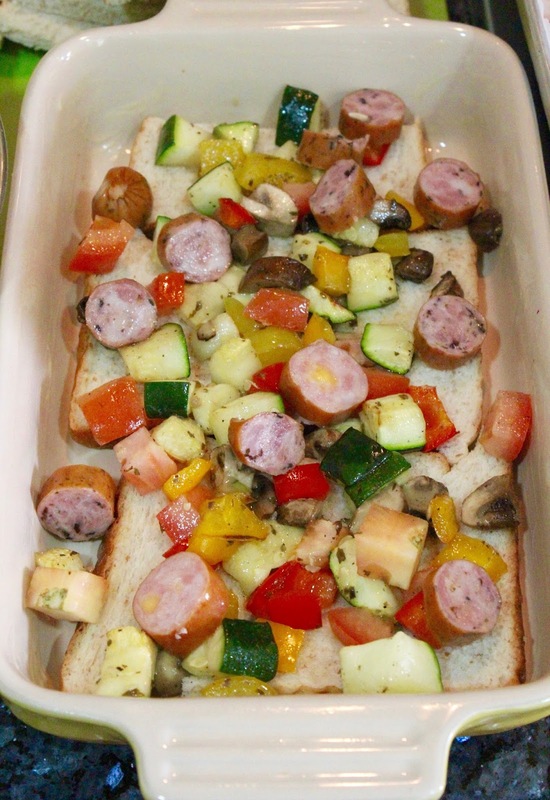 Then place the rest of the roasted vegetables and sausages over the second layer of bread. 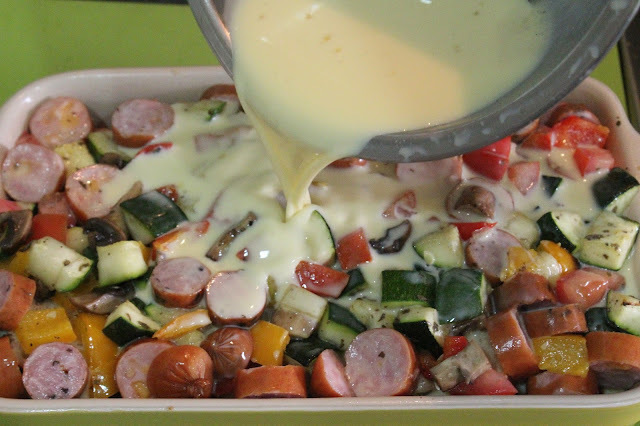 Pour the prepared custard mixture into the layered bread and vegetables. Lastly, top it with the shredded mozzarella cheese. Wrap the baking dish with cling wrap and let it sit in the fridge for at least 2 hours or overnight if this is the prep ahead dish for tomorrow's dinner. 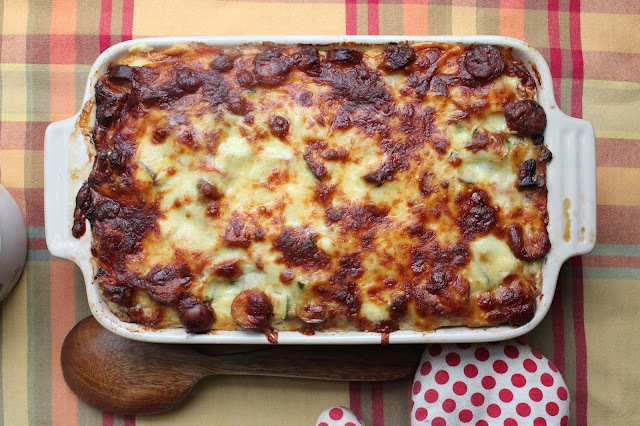 Fast forward 24 hours, you are ready to cook the strata~! Preheat the oven to 180 C.
Remove the baking dish from the fridge while waiting for the oven to preheat and remove the cling wrap. 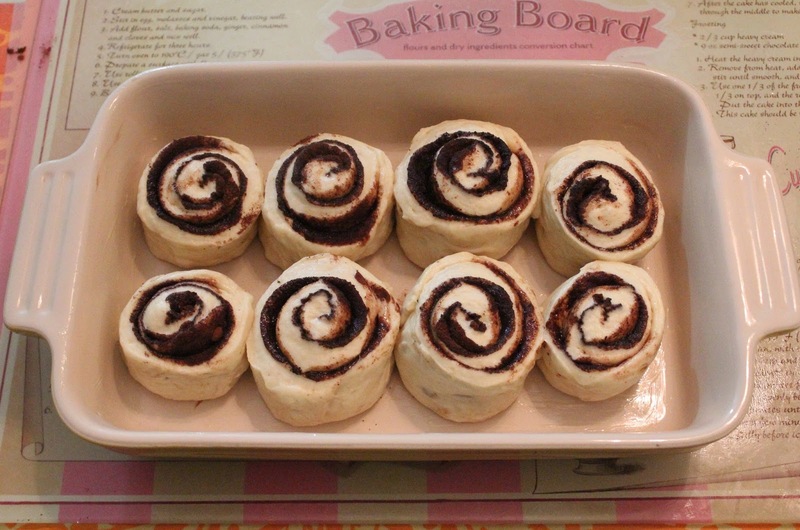 Bake in the preheated oven for 38-40 minutes. 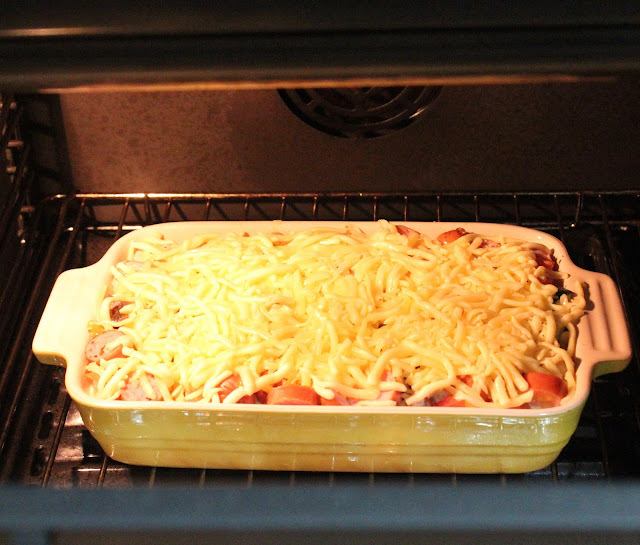 If the cheese top is browning too fast, remove the baking dish and wrap it with aluminium foil and continue to bake. This step is actually necessary, so just prepare the aluminium foil ahead. Once baked, remove from oven and remove the aluminium foil. One last look of that gooey cheese and the crusty chewy golden top before I sign off. :D Hope you will try out this dish! Perhaps you can try adding eggplant which I missed out this time. I am sure it will taste even better. Have a good one guys and stay happy!